It's been so long since I'd been actively trying to be a journalist of any type (used to work in radio and also wrote for college paper) that I'd forgotten what it was like to have a scoop on a story. For those who may not know, having the scoop means you have it before anybody else. Well, it happened to me today. 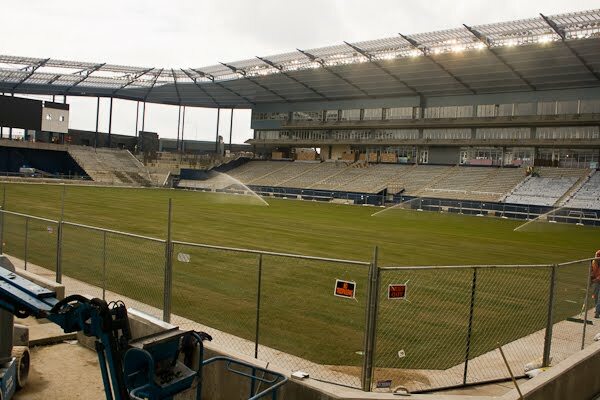 I was the only media person not employed by the team out at the Sporting KC training facility and the story just falls into my lap. Not literally, but figuratively. As I tweeted just before noon yesterday (yeah, it's late), Chance Myers went down with an injury. Under the word snakebit in the dictionary, I'm sure it has Chance's picture. Myers missed most of his rookie season with a combination of an injury and (as he's getting ready to come back from that) a case of mono. His development as a young player has been hampered by the fact that he can't seem to stay healthy for long stretches. Anyway, Myers pulled up with what looked like a groin pull. He looked like he was in a great deal of pain and the training staff was there rather quickly. Myers had to be helped from the field and did not return. As a courtesy, I asked Dave Borchardt, PR rep for the team, if he'd mind if I Tweeted about the injury. Maybe it was as a courtesy, maybe it was just me being in shock that I was the only one with the story. He said it was cool and thanked me for asking. Since the team is leaving for Vancouver a day earlier than normal, the weekly press conference was held yesterday (almost said today, but didn't want to confuse people). It's not often I have a question, so I asked Coach Vermes if Myers' injury would rule him out for Vancouver. He said that he hadn't gotten a report from the medical staff yet, Myers would probably go to the doctor, but he also said it "didn't look good." It's a good thing that Luke Sassano and Michael Harrington are close to 100% so that one of them may take Myers' spot in the lineup. On a side note, I asked forward Kei Kamara if, considering he only got 20 minutes in Sierra Leone's match in Niger, he would have rather stayed here and gone to Chicago. He quickly said, "No. It's still a cap." I think he probably would have been more useful to us, but I can respect Kamara's desire to play for his national team, even for short periods. After today's press conference, it was off to LIVESTRONG Sporting Park for the media tour. I had not, for a variety of reasons, been in the area since ground was broken in January of last year. As hard as I want to try to be a journalist first and a fan second, this stunning facility makes that hard, if not impossible. While I was on I-435, I turned my head and saw it for the first time and it literally took my breath away. Does the phrase "love at first sight" mean anything to you? 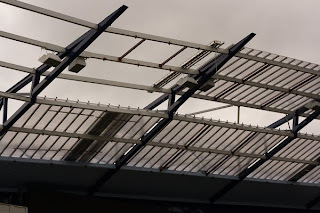 This is a section of the roof that overhangs all of the seating sections. 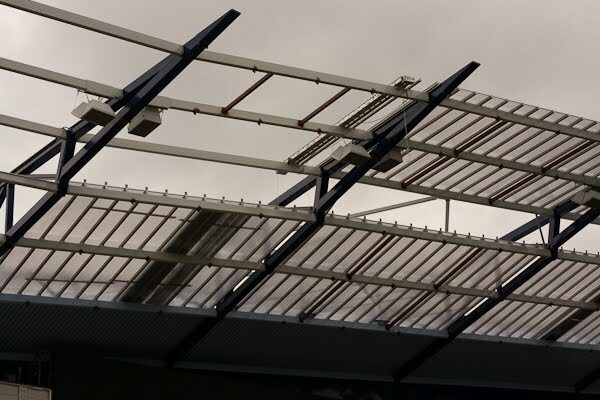 This particular section is over the stage and you may be able to see some of the bumps on the crossbeams (easier in the sections without the polycarbonate installed). Those are places to hang the lights for concerts. The stage, on the south end of the stadium, will be covered with retractable seating so you can't tell the stage is even there during games. This is the west stand. Directly in the middle is the tunnel where players will enter the field from the locker rooms (which will be incredibly sick as far as tech goes). The Sporting bench is to the left and the visitors is to the right. 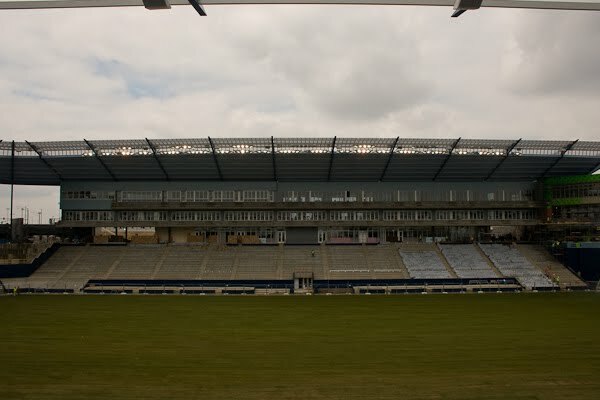 On either side of the benches, four sections in each direction, are the Field Club seats, the new stadium's equivalent of the Field Side Seating from CAB and Arrowhead. There are 35 suites in the new facility on two levels. 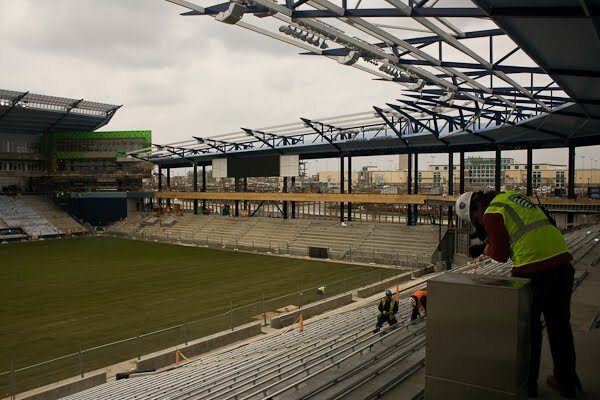 The press box is in the upper left corner of the picture, just to the right of the stadium operations suite that will control the video screens, electronic signboards and public address system. That is the "Members Stand" where groups like The Cauldron will be standing. This area (and one on the other side of the members club) are the only parts of the stadium that will have bleachers. Everything else will have seatbacks. 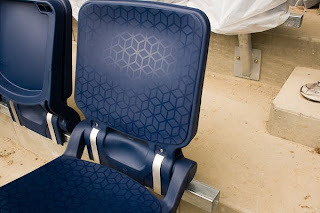 Speaking of seats, this is what they look like. The less expensive seats are 19" across, midlevel are 21" and the high-end seats are 23". I took the opportunity to sit in one and they are quite comfy, a lot moreso than you would usually get in a stadium setting. This is the view from the members club with the garage door windows up. When the weather's nice, they can leave them open to let the air and sound in, or put them down to keep the wind and rain out. As with everything else in the stadium, the club has a use on non-game days as Kansas City's first true soccer bar. If you've lived around here long enough, you've had to beg to get games on, beg again to get the sound, and that's if they like you. Here, you won't have to ask if a certain game's on, it will be a safe assumption that it will be. The space is approxiamately 8,000 sq. ft. and features a stairway to get to the concourse that serves only the members stand. 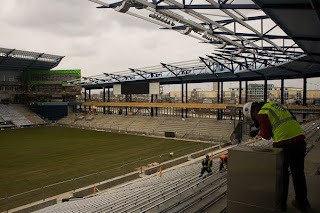 Sporting KC knows that groups like The Cauldron and others are what drive the energy and atmosphere in the stadium, so they want to take good care of those people. And to give you an idea of how much the groups have grown since OnGoal bought the team in 2006, just think about this. When they bought the team, there were less than 100 season tickets in the Cauldron. They already have 1,000 for the first season of the new stadium (out of about 10,000 for the whole facility). This stadium will be the envy of the rest of the league. It will be the first stadium lit for HDTV. The distance from the front row on the east stand to the touchline is 19'. It will be intimate and it will be loud. And as much as I want to stay calm, I have to say that when it comes to this stadium, I'm in love.